In the spirit of The Gospel According to Coco Chanel and How Georgia Became O’Keeffe, Julia Child Rules dissects the life of the sunny, unpretentious chef, author, cooking show star, and bon vivant, with an eye towards learning how we, too, can savor life. With her characteristic wit and flair, Karen Karbo takes us for a spin through Julia’s life: from her idyllic childhood in California to her confusing young adulthood in New York; her years working for the OSS in Sri Lanka; her world class love affairs with Paris and Paul Child; and her decades as America’s beloved French chef. 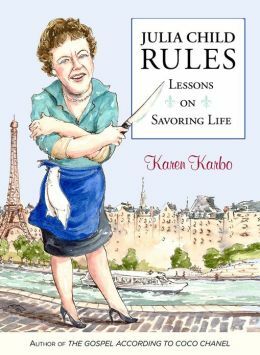 Karbo weaves in her own personal experiences and stops for important life lessons along the way: how to live by your whims, make the world your oyster, live happily married, work hard, and enjoy a life of full immersion. It celebrates Julia’s indomitable spirit and irrepressible joy, giving readers a taste of what it means to master the art of living.